PGC offers key assistance in processing application forms to support the immigration and naturalization processes needed towards living and working legally in the United States. Notarial services, form filing and required photos are also provided services. For specific needs other than above, please call the PGC office for assistance and consultation. Clients seeking assistance have represented diverse countries: American and Western Samoa, Democratic Republic of the Congo, Federated States of Micronesia, France, Indonesia, Ireland, Mongolia, Myanmar, Philippines, Venezuela, and Vietnam. PGC has adopted a Fee Waiver / Reduction Policy and will waive or reduce immigration services fees on a sliding scale as determined with reference to the 2017 Hawaii Poverty Guidelines for clients who formally request and prove that they cannot afford to pay the fees. 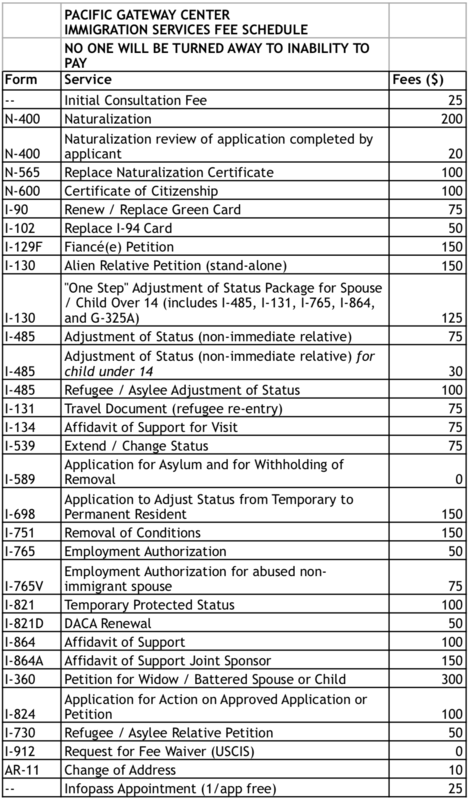 Immigration services are located at 723-C Umi Street, Honolulu, HI 96819 in Kalihi or at 653 Ala Moana Boulevard (the site of Nā Kūpuna Makamae) by appointment only. Pacific Gateway Center provides comprehensive, wraparound bi-lingual case management services to its disenfranchised groups to ensure personal safety and well-being. Case managers facilitate and support securing important government documents, housing, food, health care, religious and spiritual needs, legal assistance, employment, education, interpretation and translation services, ESL, child care, clothing, crisis intervention, transportation, and crime victim advocacy. PGC also offers both cultural and community orientation and supports civic engagement as they eventually become community members who are productive, caring and contributing to a local healthy and vibrant community.